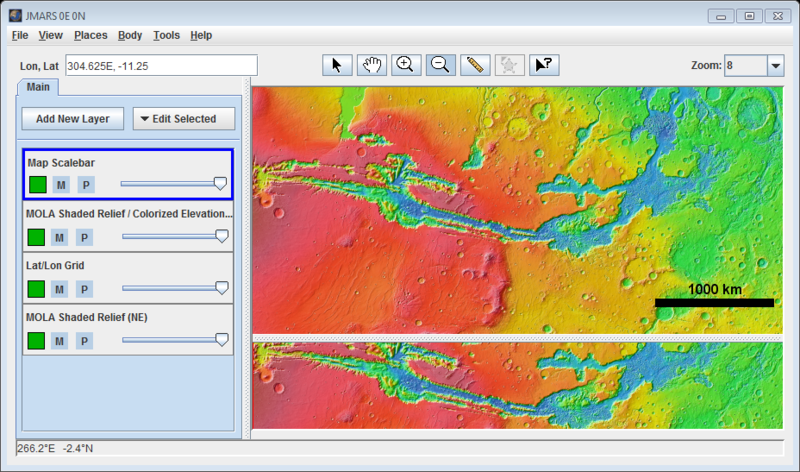 The Map Scalebar Layer, which is available in all releases of JMARS, displays a scalebar in the Main View that automatically shows the correct scale for the map being viewed. This layer is extremely helpful when taking screenshots from JMARS. Open the Map Scalebar Layer: In the Layer Manager, choose "Add New Layer" -> "Map Scalebar"
The scalebar will appear in the lower right-hand corner of the Main View. 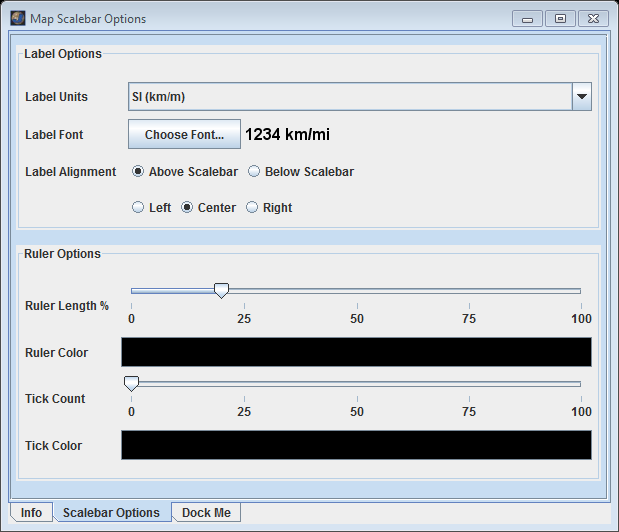 Change the Location of the Scalebar: Users can change the location of the scalebar within the Main View by left-clicking and dragging it to a new location. Change the Appearance of the Scalebar: The scalebar is opened with its default display settings. To change the appearance of the scalebar, click on the "Map Scalebar" tab in the Layer Manager to access the focus panel. Label Units: Users can choose from either Metric (km,m) or Imperial (mi,ft) units. Label Font: The font, font color, font outline color and font size can all be changed by clicking on the "Choose Font..." button. Label Alignment: The distance label under the scalebar can be justified, relative to the ruler, by clicking on the appropriate checkbox. Ruler Width: The horizontal width of the ruler can be set as a percentage of the Main View width. Ruler Color: The color of the scalebar can be changed by clicking on the black box and choosing another color. Scalebar Tickmarks: Using the "Tick Count" slider, users can change the number of tickmarks displayed on the scalebar. Tickmark Colors: The color of the scalebar tickmarks can be changed independently of the scalebar color by clicking on the black box and choosing another color.